Yovani Gallardo clearly didn’t have his best stuff last night, but battled through 6.2 innings against a tough (sarcasm) San Diego offense. Gallardo was in great shape heading into the seventh after throwing just 86 pitches. He was aided by quick innings in the third, fourth and fifth, during which he threw just 32 pitches. The sixth inning required a bit more effort thanks to Jedd Gyorko’s six-pitch flyout and Gallardo’s only two strikeouts of the night. But it certainly looked like Gallardo had another inning in him. 1) Alexi Amarista grounds out. Gallardo threw two outside curveballs to Amarista, not a bad strategy since Amarista has historically swung at nearly 40% of pitches out of the zone. The first one flattened out and landed high and outside; not Yo’s finest work, but Amarista didn’t swing at it. Oddly enough, he did swing at the second curve, which was even further outside and much lower. The result: routine grounder for Jean Segura, and a two-pitch at-bat. 2) Everth Cabrera grounds out. Gallardo retired Cabrera, but it obviously wasn’t pretty. The first two pitches, a fastball and slider, respectively, weren’t even close. Then Gallardo hung a curveball that plenty of batters could have done something with, but not Cabrera the human groundout. I call this at-bat “the beginning of the end,” even though it ended with a three-pitch out. This happened on six pitches. Gallardo continued his wild streak by throwing a change at Venable’s feet to begin the at bat. He followed with two more changeups low, but Venable hacked at them anyway, fouling off both. 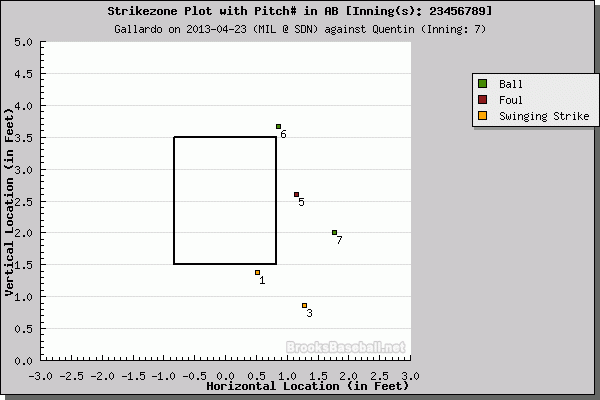 Gallardo’s fourth pitch was a well-located cutter clearly intended to induce a swing. But the next two pitches aren’t even close. I see the strategy in changing eye level, but it works better when you’re at least in the vicinity of the zone. I find the Headley sequence really fascinating. Here the dugout finally gets the picture that Gallardo is done, and Tom Gorzelanny and Burke Badenhop start frantically warming up. Meanwhile, Gallardo misses low with a first-pitch curve. 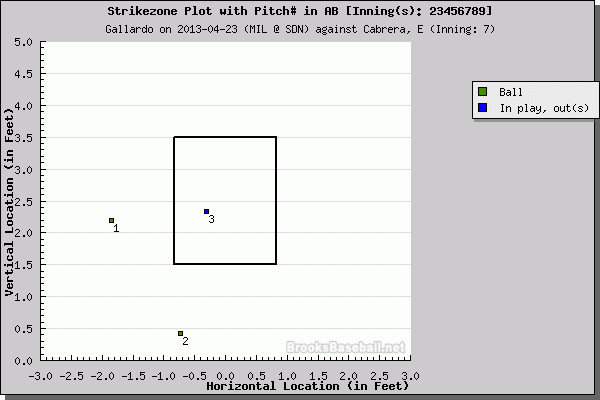 His next pitch, a fastball, hits plenty of the corner, but Gallardo has lost all credibility at this point. Headley doesn’t offer, and umpire Gary Darling doesn’t give him the call. Gallardo then shows that he can’t even command his fastball anymore, spiking one in the dirt before climbing the ladder a little too high. 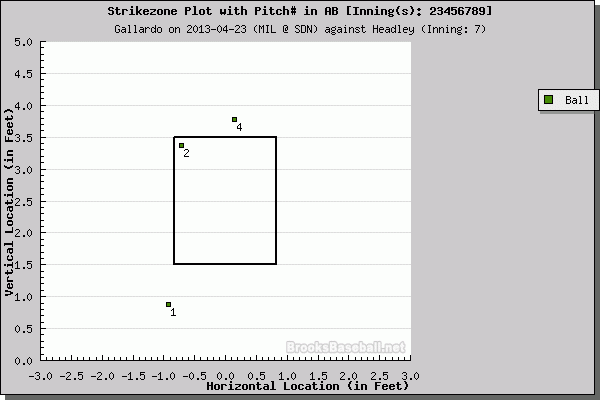 Headley was taking all the way; a four-pitch walk. Rick Kranitz goes out to talk to Gallardo, presumably to buy some time for the warming arms. Gallardo starts Quentin off with a beautiful curve, but follows that up with a pitch in the dirt. Gallardo’s third pitch, a slider, isn’t well located at all, but Quentin isn’t able to pull his bat back in time. Gallardo gets a cheap strike. Ahead 1-2 in the count, you’d expect Gallardo to burn a pitch, but he bounces a curve about a foot in front of home plate. Lucroy’s fast footwork keeps the runners from advancing, but it really doesn’t matter. Gallardo busts a fastball and a couple sliders too far away, and Quentin takes his base on Gallardo’s third consecutive walk. As for causation, there aren’t a lot of firm conclusions we can draw from this information. Fatigue is a tough sell; Gallardo threw around 100 pitches in his first two starts, then scaled back to around 90 in his next two. Maybe it was something more pervasive; Gallardo didn’t locate well all night, throwing just 58 of his 108 pitches for strikes. But one thing I think this does illustrate is the psychological battle between hitter and pitcher. When a pitcher is off, the hitters may alter their approaches to take advantage of that fact. The Padres did just that on Tuesday, but ultimately weren’t disciplined or talented enough to really make it sting. *All strikezone plots from Brooks Baseball. This entry was posted in News and tagged Alexi Amarista, Carlos Quentin, Chase Headley, Everth Cabrera, Gary Darling, Milwaukee Brewers, San Diego Padres, Will Venable, Yovani Gallardo. Bookmark the permalink.